Gray, H.B. - Component of : Early Ideas in the History of Quantum Chemistry. 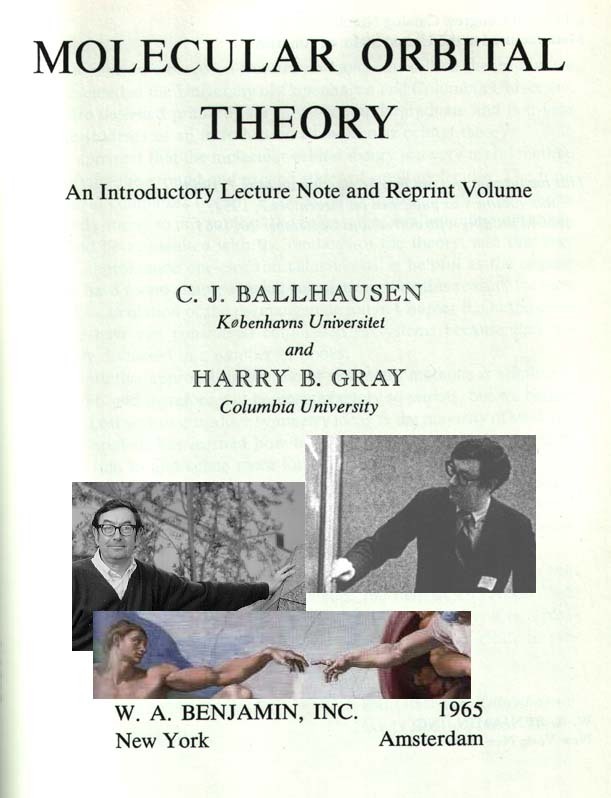 The left picture stems from Gray's 2002 Faculty page . The one at right is from an early book's dust cover. (Click the hands) Harry B. Gray was born in 1935 in Woodburn, Kentucky, USA and got a B.S. in 1957 at Western Kentucky University. He began his work in inorganic chemistry at Northwestern University, where he earned his Ph.D. in 1960 working under Fred Basolo and who also recommended Ballhausen for a postdoctoral stop. Gray received a National Science Foundation (USA) fellowship and went to Copenhagen. Ligand Field Theory in those days was getting lots of attention from inorganic chemists. After this postdoctoral year at the University of Copenhagen, he joined the chemistry faculty at Columbia University, where his main interests centered on the electronic structures and reactions of inorganic complexes. Many chemists went to visit Ballhausen in this period, e.g. Spiro who is now Prof. at Princeton. Ballhausen suggested that Gray might work on the aquo-Ni(II) spectrum. Then Gray decided to work on the electronic structures of multiply bonded units such as the vanadyl, chromyl, and molybdenyl ions. Starting in 1966, H.B. Gray built a group in bioinorganic chemistry at Caltech, where much of his research has been aimed at understanding electron transfer in proteins. His work includes over 600 papers and 17 books. Harry Gray is Arnold O. Beckman Professor of Chemistry and Director of the Beckman Institute at the California Institute of Technology. For his contributions to chemistry he has received the National Medal of Science from President Ronald Reagan (1986); the Pauling Medal (1986); the Linderstrøm-Lang Prize (Copenhagen, 1991); the Gibbs Medal (1994); the Chandler Medal (1999); the Harvey Prize (Haifa, 2000); six national awards from the American Chemical Society, including the Priestley Medal (1991); and twelve honorary doctorates. He is a member of the National Academy of Sciences; the American Philosophical Society; a foreign member of the Royal Danish Academy of Sciences and Letters; the Royal Swedish Academy of Sciences; the Royal Society of Great Britain; and an honorary member of the Italian Chemical Society. He was California Scientist of the Year in 1988. During 1997-98, he was the George Eastman Professor at the University of Oxford. Copyright © Jan. 20, 2002 by U. Anders, Ph.D.